Designed to pull from the side of the kettle instead of the middle. This helps reduce trub from entering your fermenter. By adjusting the height of the dip tube you can also control how much wort you leave behind in the kettle. Has a 1/2 inch MPT fitting on the end, that screws into the inside coupler of our Heavy Duty kettles. Will only work if your kettle has a 1/2 inch FPT coupler on the inside of the kettle. Solid diverter. Agree with clamp on the inside. Flow rate is very good and definitely allows for extracting more wort without the hop sludge. Works well for setting you fluid pickup to edge of kettle. 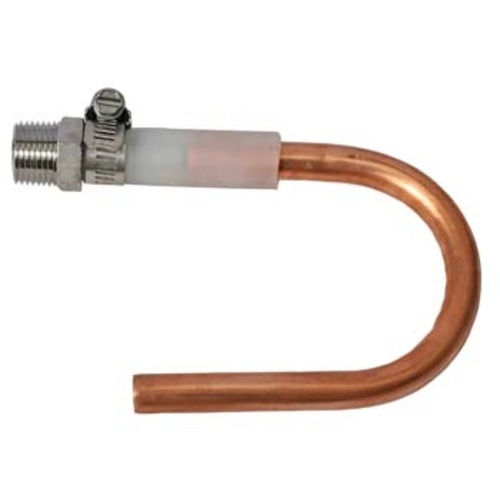 I found that the silicon tubing connection to the copper was loose and needed to add a clamp. Now I can't make easy height adjustments as I had hoped. No clogging problems at least. Everything I ever ordered from here has been top notch. Does draw from the side but does not allow you to draw any lower into the kettle than the valve is which is what I wanted it for. I probably did not explain what I needed so I will just chalk this up to an experience.